Roggan is a male Troglodyte. He is 5’ tall, and around 140 lbs. Troglodytes are naturally ‘Fluffy’, but since he’s light, he has very little fat on his arms or legs. Troglodytes are humanoid, with webbed hands that are reminiscent of frogs, and lizard-like feet and head. They have very large, dark eyes. Roggan’s are deep brown, almost black. Skin tone is grey, and Roggan is very pale. They have fangs protruding from their lips. Roggan has been exiled for most of his life, so he doesn’t have the same afinity for pure stone weapons, he also feels that working stone with chisels and picks is mean. He uses a dwarven halberd, expertly made, and a war maul with a polished wooden handle that has Apis’ symbol etched and painted on it. He always has his Sun Sight Amulet on, as his sight in daylight is atrocious, and he always has his hood up, to protect his eyes, except in shadow. He has a pet rock, made of Schist, called Bluto; He never goes anywhere without him. He has a silver ring with Apis’ symbol on his index finger. He’s always picking up special rocks, and putting them into his small leather pouches, as he’s always happy to take new ‘rock friends’ with him. Roggan was an Iron Golem, all gleaming surfaces with a twinkle in his onyx eyes, a functioning mouth, and an extra pair of smaller arms at his sides for delicate tasks. He was 20 feet tall, and weighed 3,400 pounds. His form was reminiscent of a human, but almost deformed by muscular formations in his torso. As a golem, he wore no clothes, but luckily Roggan does not have a perfect working anatomic knowledge of humans, so there was no problem. He had a white cape, though it was big enough to be used as a tent by most races. Roggan crafted this Iron Golem body himself, and with the help of Master Kel-ed in Wisdom, he transferred his essence into it. While in the city of Rivendyne, Roggan created a Stone Golem named Gina that died while CrIsis visited Wisdom. Roggan portrait by Gaitkeeper. Full size picture can be found here. Dark Brown Robe 2 1 Worn, 1 in Backpack Simple cloth robe, died a dark, rustic brown. Scroll: Heart of Defense 1 Backpack A basketball sized platinum heart hangs above head. + 10 save HF, + 5 all other saves, and can cast any of these spells total (aggregate) of 6 times- Sense evil, sense magic, turn dead (2D4x10), remove curse (touch), resurrection (+ 30%), healing touch (additional 4D6). Lasts 1 hr/lev or until all spells used, whichever is first. Large Sack 1 Worn Canvas bag with a leather strap worn across the shoulder. Flint & Tinder box 1 Large Sack Small wooden box with flint and room for tinder to start fires, used for camping. WIZARD JARS 2 Large Sack 2 LB Crystal Powder, Worth 1 G, and 16 G respectively. Rescued friends 14 Small Sack Assorted stones, pebbles, rocks; polished and rough. Seemingly no intrinsic value. Emerald 1 Small Sack Pristine (Until used), over 1Karat. Roggan uses it in Stone Magic. Diamond 1 Small Sack Pristine (Until used), over 1Karat. Roggan uses it in Stone Magic. Wooden Symbol of Apis 1 Small Sack See Name. Earth Elemental Items 2 Small Sack See Name. Ring of Apis 1 Left Index Finger Intricately worked copper ring with the symbol of Apis etched on the wide face. Magical Wooden Goblet 1 The name “Gary” is carved into the Goblet, if water is poured into it, it grants Save VS Poison/Disease +3 bonus, and speak any earthen race language, 1D10 Minutes. One or the other, once per day. Keg of Sand 1 On the River Boat 1 Cubic Foot of Sand with a pinkish hue. The small keg container is about 15 inches across and high, sealed with metal rings, and a wooden lid held in place with a wooden peg. All told weighs 93 lbs. Roggan old. Roggan not really old, just old. Roggan remembers Trog home. Beautiful, happy place. Roggan had many friends there. Rocks, Gems, Trogs. Roggan happy there. But Trogs hate Roggan. Them not talk to rock friends. Them mean to rock friends. Them use hammers and picks, hurt rocks. Them sell Gems to Pink-faces. Roggan run away. Trogs try to hurt Roggan, for talk to rock friends. Roggan run to Pink-face – Dwahrff? – home. Nohrfowlm. Pink-faces not like Roggan. Rogan talk to Gem friends. One dwahrff like Roggan. Roggan help dwahrff friend, help gem friends. Dwahrff name Murodin. Roggan travel with Murodin, find new gem friends Roggan not see before. Murodin give Roggan neckie. Neckie look like eye. Neckie help Roggan see in day. Murodin nice, Murodin also give Roggan Bluto. Bluto Roggan best friend. Roggan take Bluto everywhere. Roggan meet missionaries for Horus with Murodin. Roggan think Horus not nice, not like Apis. Apis nice. Murodin like Apis, too. Murodin give Roggan ring with Apis face. Roggan love Apis. Apis funny cow-lady. Roggan never see cow-people. Murodin die, Roggan leave Nohrfowlm. Roggan sad Murodin gone. Murodin give silly horse to Roggan. Roggan horse name Murodin. Roggan go to Wrijin. Roggan live with Wakiw. Wakiw nice. Wakiw puppy-lady. Puppy-men funny the Woafin. Wakiw teach Roggan magic. Wakiw talk to Bluto. Bluto happy, Bluto like Wakiw. Wakiw not travel, stay in Wrijin. Roggan like Wrijin. Roggan meet Apis!! Roggan never more happy in Roggan life! Apis send Roggan to new friends. Troglodytes exile, but do not hunt down, any magic-wielding Trog. They don’t have as much fear of other magic-wielding races, since they rarely have contact with them. They passed by Wrijin a lot while Murodin was alive, on expeditions to the northern mines, where he met a Wolven Warlock, Wakiw. 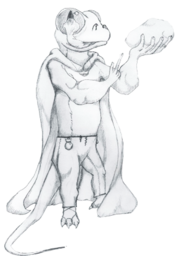 Wakiw taught Roggan how to harness his natural magic abilities, and lived with Roggan for a majority of his life. They grew close, and will attest to anyone that asks they are siblings. Roggan’s original body was a tall male Troglodyte, a picture can be found here, and he lived in it for over 60 years. He uses a magic Stone Staff, a dwarven halberd, expertly made, and a war maul with a polished wooden handle that has Apis’ symbol etched and painted on it. He has a pet rock, made of Schist, called Bluto; He never goes anywhere without him. He has a silver ring with Apis’ symbol on a neclace around his neck, and the Ring of CrIsis on his right ring finger. He’s always picking up special rocks, and putting them into his small leather pouches, as he’s always happy to take new ‘rock friends’ with him.